Finely Tuned | Music | Style Weekly - Richmond, VA local news, arts, and events. 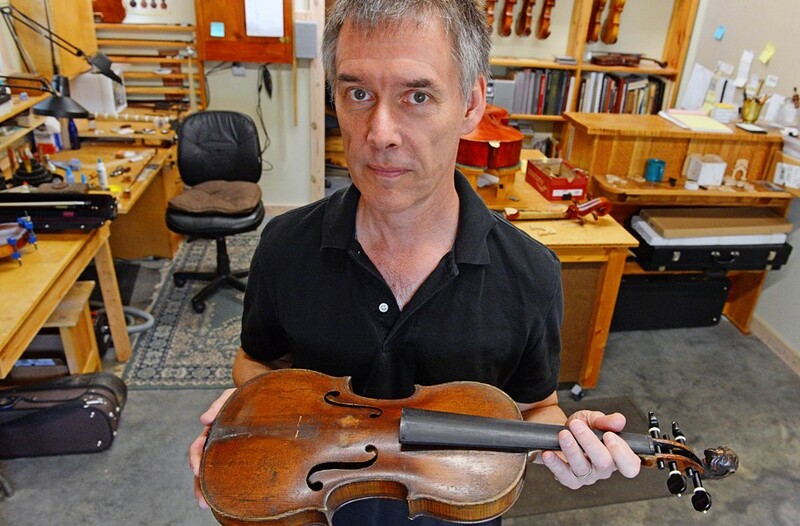 Scott Elmquist VCU graduate and violin-maker Don Leister has worked to hone his craft for the past 27 years. When Don Leister attends the Richmond Symphony Orchestra, he’s there to not only listen to his music but also admire his handiwork. “I would say that whenever someone plays my violins in the Richmond Symphony, that’s a thrill for me,” he says. Although he repairs about 300 bows a year, Leister’s proudest achievements are the 75 violins he’s created by hand during the past 27 years. Each of his instruments requires more than 100 hours of work and is made entirely from scratch in his workshop. To learn his craft, Leister attended a number of workshops and conferences. At the Violin Makers of Association of Arizona International Convention in 2002, he was awarded the top prize overall for his violin, which encouraged him to continue. Leister takes his inspiration from the violins of Cremona, Italy, where Bishop Nicolo Sfondrati, who became Pope Gregory XIV in 1590, was a fervent supporter of the arts and grew the town’s musical reputation — specifically the work of violin makers Nicolo Amati, Giuseppe Guarneri and, most famously, Antonio Stradivari. Leister purchases rare, limited production books with measurements and specifications of the Cremonese violins. The two primary woods used in violin-making are maple and spruce. He imports the maple from the Balkans, as Stradivari did, and spruce from Northern Italy. Though he often purchases varnishes from supply shops, he’s also experimented with picking his own resins on trips to New England. “Don comes from a tradition of crafts-people who have a very strong sense of respect for craft, for figuring things out mechanically, and I think that’s deeply ingrained in his family values,” says his wife, Laura Chessin, an amateur violinist. Chessin is speaking of Leister’s grandfather and great-grandfather, who also were woodworkers. Leister’s workspace is adorned with an authentic Native American bow and arrow that his great-grandfather gave to his dad and his dad’s friend. The attention to detail helps Leister elevate his product in an increasingly crowded marketplace that’s been diluted by a spate of Chinese-produced violins. Adelman Vorenberg notes that although Leister is one of the best local craftsmen for violin repair and construction, Richmond Symphony Orchestra violinists generally use someone with whom they have a personal relationship, and that’s often someone they met before moving to Richmond. Although he does have customers from the symphony ranks, Leister doesn’t actively try to sell to its musicians, although he tries to get his instruments in front of them for feedback. In addition to his violin repair, Leister has been contracted at various times with the school systems of Richmond and Chesterfield, Hanover, Stafford and Henrico counties, and regularly donates bows to schools in the Richmond area as well as the Richmond Youth Symphony Orchestra. This work has extra significance for Leister, he says, because he was a military brat who had more than a dozen different addresses before starting high school. He stopped playing the violin when he moved to a school in Georgia that didn’t have a program. You can find information on Don Leister’s work at donleister.com.